Nassau County is the first school district I’m aware of that has been faced with a citizen’s challenge to topics in the schools’ science instructional materials. I told you about this back in early November (Nassau County complaint: “stop promoting this scientifically inadequate theory of evolution as fact to our students”). The disgruntled citizen is 71-year-old Jay Shutt who says he retired after 40 years of teaching. His complaint to the school district earned him an official hearing in front of an appointed hearing officer Nov. 1. I obtained the materials from that hearing (Download here: Evolution Materials Nassau County). It’s a lengthy PDF that contains Shutt’s original complaint, the script he read from during the hearing, and the hearing officer’s summary of evidence. It is my goal to demonstrate to the Board that the material concerning evolution presented in the 3 textbooks I reviewed are not entirely accurate, objective, balanced, and noninflammatory, nor are they suited to the needs of the students. However, my hope and prayer is the Nassau Board of Education will not only mandate macro-evolution and an old earth not be taught as facts, but will allow Bibles to once again be distributed to our students. And further the Board would use its influence with the state of Florida to bring back legalized corporate prayer and Bible reading to our schools. This book contains material that leads the reader to believe that “bacteria to man” evolution and an old earth of 4.5 billion years are proven scientific facts. Creation scientists would argue that there are dozens and dozens of scientific observations that indicated the earth is young, only several thousand years old. 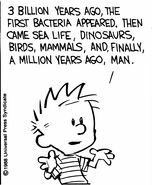 Additionally, creation scientists would argue that bacteria to man evolution is impossible because (1) living things only come from living things, not from matter and energy. (2) living cells need information to live and function. That information must come from an intelligent source. It cannot come from matter and energy, and (3) life is too complex to be explained by natural selection and chance beneficial mutations. The human genome has 3 billion base pairs, and the human brain operates faster than 30 trillion calculations per second, exponentially faster than any computer. The recommendation the school district staff is making to the board is to “Continue using the challenged textbooks without placing a disclaimer in them.” You can see that document here: Cover Sheet Agenda Statement for Textbook Challenge Nassau. However, I’m a bit worried that during the hearing, the only counterargument presented by the school district was that replacing the textbooks would be expensive. Of course, I don’t expect anyone to answer all of Shutt’s laundry list of ignorant claims, but shouldn’t someone have mentioned that the textbooks are aligned with the state science standards and therefore are necessary for students to pass the state mandated biology end of course exam? So, yes, as I predicted long ago when the new instructional materials law was considered by our oh-so-wise lawmakers with little to no debate that this would happen. I knew school boards would be sucked into exactly this time wasting black hole of antiscience garbage. Lawmakers brushed off my concerns as silly. It turns out that I was right. Imagine that. And we know that complaints about evolution or climate change also popped up in Palm Beach County and Brevard County. 2. Basis for Contesting Instructional Materials. a. The instructional materials were selected for use in a course or otherwise made available to students in the Nassau County School District but were not subject to public notice, review, comment, and hearing. 3. Procedure for Contesting Instructional Materials. a. The parent or resident must file a petition, on a form provided by the Nassau County School Board and made available on the Nassau County School District’s website, within 30 calendar days after the adoption of the instructional materials by the Nassau County School Board. If I’m reading the proposed Rule correctly, future citizen complaints must first prove that a textbook’s adoption process lacked proper citizen input and that the complaint must be filed within a month of the adoption. That should close the door on complaints like Shutt’s. Other school districts need to adopt rules similar to this one if they haven’t already. There are ways determined creationists can still use this new instructional materials law to cry foul in an attempt to get a hearing, but, hopefully, the most nonsensical will be filtered out. My hope is that Nassau County will agree with the recommendation to dismiss Shutt’s disclaimer sticker request and this will be the last of it. But as I showed over and over again in my book, Going Ape, issues like this one tend to bring out the closet creationists on school boards. We’ll see on Dec. 14. It seems to me that submissions such as that by Mr Scutt lack objective evidence for both matters of objection as well as the matters for which he advocates. I wonder whether the Board might find it productive if future complainants were required to provide specific citations for scientific evidence supporting their objection, ditto for any alternative propositions that they make? Second, it might also be useful if the Board were to identify any commonly proposed matters known to be illegal and therefore unacceptable to be proposed by complainants . For example, the introduction of corporate prayer and Bible readings. Or, that ID is not science but religion (refer Kitzmiller vs Dover”..